My 13-year-old is collecting stories of faith for a special family book she's putting together. And today I'd like to record one of my mom's most faith-promoting experiences. She's never shared it with anyone outside our family because she thought people would think she was making it up, but she's given me permission to share it here, and I hope I can record it appropriately. 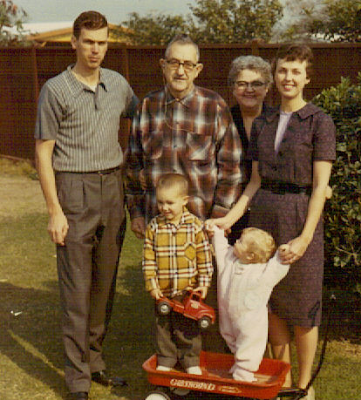 About 50 years ago, my mother had just two young children--my brother Robert and my sister Linda--and she was expecting my sister Susan. Mom had been participating in a regional church concert, and the women's chorus had been rehearsing for weeks. The day of the final performance came, and just moments before she was supposed to start getting ready, she received a phone call from my dad, saying something had come up, and he wasn't going to be able to come home and care for the children while she went to the concert. She looked around at the messy kitchen and her two little children eating their dinner. She looked down at her protruding belly and felt completely overwhelmed as she contemplated the effort it would take to get everyone cleaned up, secure a babysitter, and find a ride to the concert. She thought about how hard she had worked to learn her part for the choir concert and how excited she had been to sing. And then she did exactly what I would have done in her situation. Leaving Linda in the high chair for a moment, she went into the back room and knelt by her bed. Emotionally unable to say a formal prayer, she just let the tears flow and repeated the words, "I'm sorry. I'm sorry." She was sorry that she was so weak. Sorry she was going to waste all of the effort she'd spent preparing for this musical number. Sorry if she'd let the Lord down in some way. All of sudden, she felt an electrifying, empowering feeling of energy course through her whole body. It went down her arms and into her legs. It lifted her up from her knees with the kind of strength she had never in a million years expected to feel on that night. "Why am I saying I'm sorry," she thought, "when I feel better than I have ever felt?" So with that energy, she ran into the kitchen and quickly cleaned up the dinner dishes and got the children settled. She called a babysitter who usually never wanted to babysit but this time agreed to come right over. She called a friend down the street to see if she could get a ride to the church, and her friend said, "Well, I'm running a little late, but I can take you if you can be ready in five minutes." And then she went quickly into her room, put on a skirt and a blouse, brushed her hair, and had so much energy that she couldn't even sit down. "I was running around the house, and I felt like I was meeting myself coming and going. I didn't know what to do with all that energy!" she told me. When she and her friend arrived at the church, they discovered they were just in time. The women were all lining up to go into the choir loft. She was so happy. She sang her part--just like she'd practiced it--and she felt elated that she'd been able to get there, when it had looked utterly impossible just moments before. After the song was over, she thought, "I'll just sit down here in the audience and enjoy the rest of the numbers." The overwhelming fatigue she'd felt previously returned with the same intensity. "I felt completely drained. Like I could barely move. The energy was gone." As she was arranging to get a ride back home, she quietly asked the Lord, "Why couldn't this energy have lasted all night?" "Because I want you to know that this evening was My special gift to you." I've thought of this story more times than I can count. It's beautiful to me for many reasons--mainly because it represents the simplicity and power with which the Lord has blessed my life over and over again. My mom could have spent the evening being mad at my dad for being late. She could have said, "Look at me--pregnant and tired and doing all this housework. What's the point of even trying to do anything else?" But she didn't do that. She didn't even think it. She turned to God and poured out her heart to Him. And that night, He gave her a beautiful, personalized gift. That gift, however, wasn't just a singular event. It was an experience that strengthened her faith. And it strengthened my faith. And now it's strengthening my daughter's faith. I hope that by sharing this story here, it will also strengthen yours. What a true miracle and wonderful gift she was given that night. Oh April, this story speaks so much to my heart! I have had so much added to my plate in the past few weeks and I know there will be moments coming up where I will be in the same shoes as your mom was. I love this perspective and really needed to hear it right now. Thank you for sharing this beautiful story. Sharon Kaye, you are like my mom in so many ways. I have thought over and over again of the stories of faith you shared with me. Thank you for your wonderful example of motherhood!